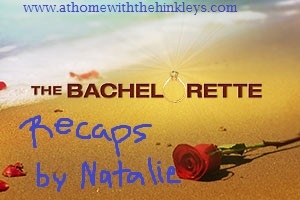 At Home with the Hinkleys: The Bachelorette Recap: Finale Part 1/ It ain't over until you are in a limo. 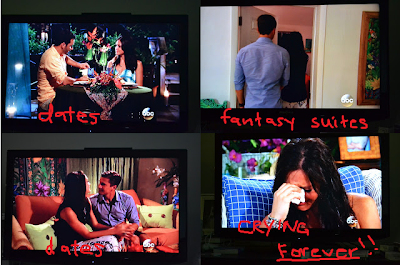 The Bachelorette Recap: Finale Part 1/ It ain't over until you are in a limo. I didn't recap Men Tell All from last week because honestly it was a snoozefest. The jerks try to defend their behavior, and we get to re-watch half the season. I already saw it the first time, thanks. But I am glad she was there, that was pretty fun. Way to widen your demographic, guys! So in a nutshell here was finale part 1. She has lovely dates in Antigua. I had to check with Google because I was certain all these fools were uncultured and didn't know how to pronounce this word. Whoops, apparently antig-ah is how the locals say it. Whatevs. Either way, her dates with Chris and Drew were fabulous and romantic, and they both are confident that they wanted to wife-up Des yesterday. FINALLY Des and Brooks get to their date in which Brooks breaks her heart right outta the gate. Then we get to sit and watch this awkward spectacle for an entire hour. It was excruciating. This was the saddest thing that ever did sad. Patience isn't one of my virtues. I really wanted Brooks off my TV. Not to gloat or anything, but I have had more than a few opportunities to break up with guys in my day, and the best (and only, in my opinion) is to just rip the bandaid off and get the heck outta dodge. If you don't, you run the risk of someone guilting you into staying with them when your mind is already made up. This was totally Des's angle. She admitted she loved him and how no one she loves ever loves her back... #girlplease. Did you forget the last two steamy nights you spent with two different totally hot guys (when she was clearly not interested in anyone but Brooks, don't get me started...) who have said again and again that they LOVE you. Ugh. She wanted to make Brooks feel way worse than he already did, and mission accomplished. 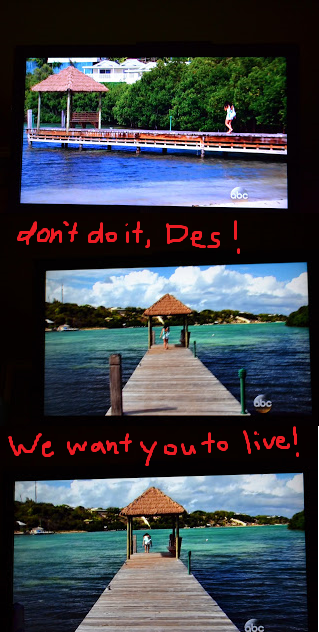 Of course it ends in a dramatic fashion, where for a moment we wonder if Des is going to go jump off the dock in a personal 'A Star is Born' tribute. Nope, just more crying. 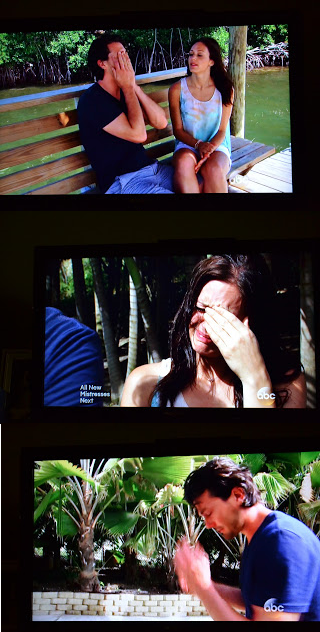 But Brooks seemed taken aback when Des told him she loved him...so I bet we haven't seen the last of him. Mark my words. PS, don't forget to check out the 50% off ad sale! wasting months by watching this show and seeing well that she dont get anyone from the looks of it. she's gotta send 2 guys home and hell Drew is gay as gay can be and brooks is just dumb as hell. I doubt i watch another one b/c this one disappointed me. LOL this show is just so ridiculous. 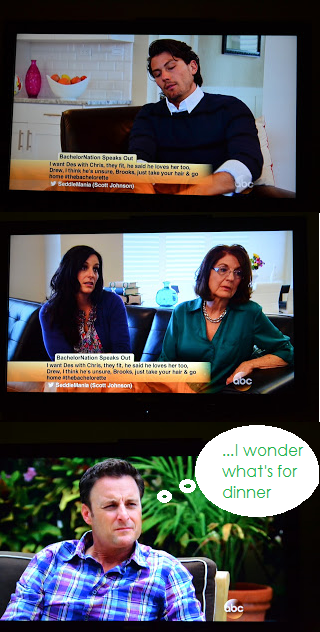 I know I know..I can't judge with all the bad reality tv I watch too (dance moms anyone?!) but I'm happy with just reading your hilarious recaps and not having to watch how insane these people are for myself! Keep 'em coming! He'll be back! I just have a feeling! Omgsh! Arg...I was too yelling at him and telling Brooks just how stupid he was. 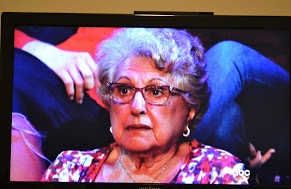 Des was so sad, I am thinking that he will be back next week as well. He truly looked like he regretted it!